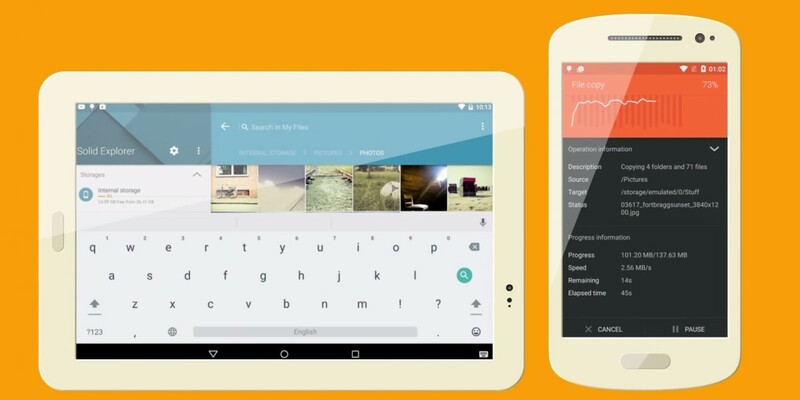 After six months of beta testing, developer NeatBytes has updated its Solid Explorer file manager app for Android. The latest version brings a Material Design interface, support for numerous cloud storage services and the ability to beam media files to your Chromecast-equipped TV. Most notably, Solid Explorer lets you view your files in two independent panels (in landscape mode) and drag-and-drop to move them between folders. You can also connect your cloud storage services to the app and view all your files in one place. Currently, Dropbox, Google Drive, Box, OneDrive, Sugarsync, Copy, Mediafire, Owncloud, Yandex and Mega are supported. In addition, Solid Explorer can connect to private online storage or sites via FTP, SFTP, WebDAv and SMB/CIFS. Plus, it has built-in music, video and image viewers so you can check out your media without leaving the app. Solid Explorer is available as a free download with a two-week trial. You can unlock the full version for about $1.75 and get additional icon packs for about $1 each. It also supports USB OTG drives, but that requires a plugin, available for $1.40.